The phrase “gene drive” often sends a shudder down a scientist’s spine: one of awe, dread, and wonder. Tiny snippets of engineered DNA, gene drives are nuclear-grade powerhouses that utterly destroy the rules of inheritance. Rather than the classic 50/50 coin toss, a gene drive can rapidly push inheritance rates to over 95 percent, pummeling a trait down entire generations and irreversibly changing an entire species. So far, scientists have only dabbled in this “God mode” of inheritance in insects, with the hope of eventually wiping out mosquitoes that carry malaria and other transmittable diseases. Part of this handcuffing stems from bioethical and ecological concerns. The other part is purely technological: it’s really hard to get gene drives to work in mammals. That’s about to change. In a paper published last week in Nature, a team from the University of California, San Diego described the first rudimentary gene drive that works in mice, with a large caveat—only females are susceptible, and even then, inheritance rates are only pushed to the high 80s. “Our findings suggest that doing this in mice is more complicated than it was in insects and that does raise questions about whether this will ever be as efficient as you’d need for wild release,” said Dr. Kimberly Cooper, who led the study. Conservation groups have previously considered using gene drives to reduce the population of invasive rodents in New Zealand, Midway Island, and other regions. By pushing an “infertility gene” through a population, for example, countries plagued by rodent invasions could solve their problem without resorting to deadly poisons. While Cooper’s results potentially throw a wrench into these plans, they do offer a large spark of hope: we now have conclusive evidence that gene drives work in mammals. “It seems certain that the promise of continual improvements in gene drives will be matched with even more discussion of how to move forward. The development of this technique to generate a mammalian gene drive is another milestone in this exciting area of research,” said Dr. Bruce Conklin at Gladstone Institutes, who wrote an accompanying commentary but was not involved in the research. Cooper had no intention of remaking nature when she decided to look into gene drives. Rather, her jam is evolution. 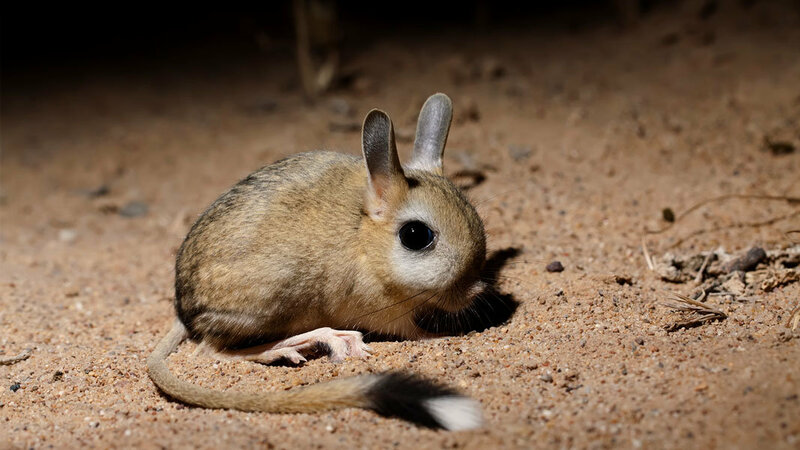 Cooper studies the jerboa, a hopping dessert rodent with springs for legs. Her lab was trying to tease out the set of genes that could transform the genetic profile of ordinary lab mice towards that of a jerboa. Turns out, it’s an extremely time-consuming task. Inserting genes into mice and waiting for them to “stick”—so that a mouse carries two copies of the desired gene—takes generations of breeding. A three-gene edit, for example, could take thousands of mice before obtaining one with the desired genetic makeup. Similarly, scientists trying to engineer genes relevant for human diseases into mice to make model animals face the same roadblock. “Our motivation was to develop [a form of gene drive] as a tool for laboratory researchers to control the inheritance of multiple genes in mice,” she said. Rather than brute-forcing the problem, Cooper contacted her colleagues who had recently described this type of “active inheritance” in flies. Here’s the recipe: the DNA letters needed for a gene drive—dubbed a cassette—contain instructions to make the CRISPR machinery. Once scientists stick the cassette into a chosen site on one chromosome (we have two in each pair), it churns out Cas9 “scissors” that cut the other sister chromosome. The cell, sensing DNA damage, ends up repairing the cut using the gene drive-containing chromosome as a template. Voilá, both chromosomes now have the gene drive (the nerdy term is “homozygous”), ensuring that the drive will make it to subsequent generations. Cooper took a different approach. Her team first made a half gene drive called CopyCat, which contained instructions to make the guide RNA—the “bloodhound” component of CRISPR that targets specific DNA—and stuck it into a gene called Tyr. These mice were then bred with mice containing the other half of the CRISPR machinery—Cas9. In this way, only mice that inherited both CopyCat and Cas9 will essentially have the complete gene drive within their DNA. Why Tyr? The gene controls the production of an enzyme called tyrosinase that makes pigments, including those in the fur. This gives the researchers an easy readout: black mice didn’t inherit either component, whereas gray ones only got a half dose. White ones got the full toolkit on both chromosomes. To be fair: because the mechanism is spread across two animals, it isn’t technically a “gene drive.” Cooper went with this route because it lowers the danger of a gene drive escaping into the wild. With only half the mechanism, an engineered rodent wouldn’t be able to spread the trait like wildfire through multiple generations. Surprisingly, several rounds of testing showed that the drive only worked in females, pushing white fur inheritance to roughly 86 percent. While that’s a big jump from the usual 50-50 split, it’s still a far cry from the 95 to 100 percent copying rate seen in mosquitoes. Recombination happens to improve the odds of inserting a gene drive: if one chromosome gets cut, its paired partner will repair it with the desired DNA. This pairing up process is a lot shorter in sperm than eggs, and if a cut occurs when the chromosomes aren’t paired, it ends up destroying the Cas9 cutting site. “We might be able to improve the efficiency and make it work in males if we can get the timing right,” said Cooper. One bonus of a mammalian gene drive is that it could be a lot more controllable in the wild than an engineered mosquito—after all, they don’t fly. In this sense, Australia, New Zealand, and other islands are ideal places to experiment with rodent gene drives in the wild. But as Cooper’s results show, we’re still near the starting line. The team is now working to springboard their single-gene modification to simultaneously changing multiple traits. “Now we want to see if we can efficiently control the inheritance of three genes in an animal. If this can be implemented for multiple genes at once, it could revolutionize mouse genetics,” said Cooper. The prolonged timeline to generate usable mammalian gene drives also comes with an upside: the time will give scientists, conservationists, bioethicists, and all other parties more time to ponder if we’re ready to tinker with the fate of entire species. For now, Cooper is happy to keep her focus in the lab. “With further development we think it will be possible to make animal models of complex human genetic diseases, like arthritis and cancer, that are not currently possible,” she said. Or even make a jerboa out of lab mice.